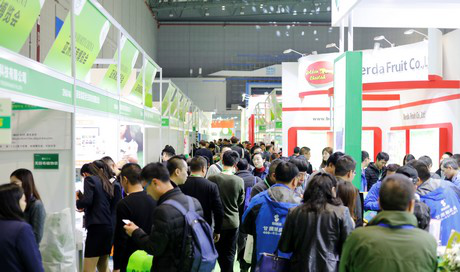 Asia Fresh is the flagship trade exhibition of VNU Tfresh Conference and Exhibition Co,. Ltd. in China. This exhibition is a global exposition specialized in the fresh fruit supply chain. After more than 10 years of hard work and experience in the Chinese fruit industry, VNU Tfresh will organize the Asia Fresh exhibition in the Shanghai Exhibition Center (Shanghai International Fruit and Vegetable Exhibition) on June 5th-7th, 2019. The organization will simultaneously arrange a specialized discussion forum for the cold chain circumstances in the fruit industry. A global fruit map, released by the Dutch Rabobank in 2018, clearly shows China's growing import volume of fresh fruit. Global fruit trade is dominated by bananas, apples, citrus fruit, and grapes. South America is the main driving force behind global fruit export, and China is an immense import market for global fruit trade. China is the largest fruit producer in the world, and the country is quickly expanding and developing the fresh fruit and processed fruit import and export industry. Import fruit is becoming more and more popular in the Chinese market. Chinese traders in the fruit industry are naturally eager to try their fortune in the import and export business. However, the fruit industry currently has one major ache, the cold chain is less than perfect. The loss of fruit during storage and transport eats into the profit margin of importers and fruit retailers, and increases the cost price of imported fruit for Chinese consumers. The Asia Fresh exhibition will gather specialized industry specialists looking for solutions that help develop the fruit industry. These specialists will participate in the discussion forum on cold chain in the fruit industry that takes place during the exhibition. They will address in particular the areas of temperature control, keeping organic products fresh, the internet of things, and big data. They will focus their discussion on innovative technology and the development of key points of interest. Together they will officially open the age of intelligent cold chain supply in the fresh fruit industry. Data shows that among the trade visitors of the 2018 Asia Fresh exhibition around 31.4% of the fresh fruit and vegetable producers, and around 15.5% of the fruit and vegetable retailers were particularly interested in the development of keeping fruit and vegetables fresh post-harvest and the cold chain. Director Hou of Beijing Agibiotec Co., Ltd. expressed his view on the industry during the 2018 Asia Fresh exhibition. Director Hou advised people in the Chinese fruit industry to pay close attention to the development of technology that keeps fruit fresh. Data from Beijing Agibiotec shows that the damage to fruit during transport and storage is severe. The damage rate can reach as much as 20%-50%. The organizers of the exhibition hope that the specialized discussion forum will attract a large number of people active working on solutions that keep fruit fresh, and will facilitate the exchange of information among them. The forum allows specialists to discuss current trends in the industry as well as possible future developments. Readers who would like to learn more can follow this link to the website of Asia Fresh (English).